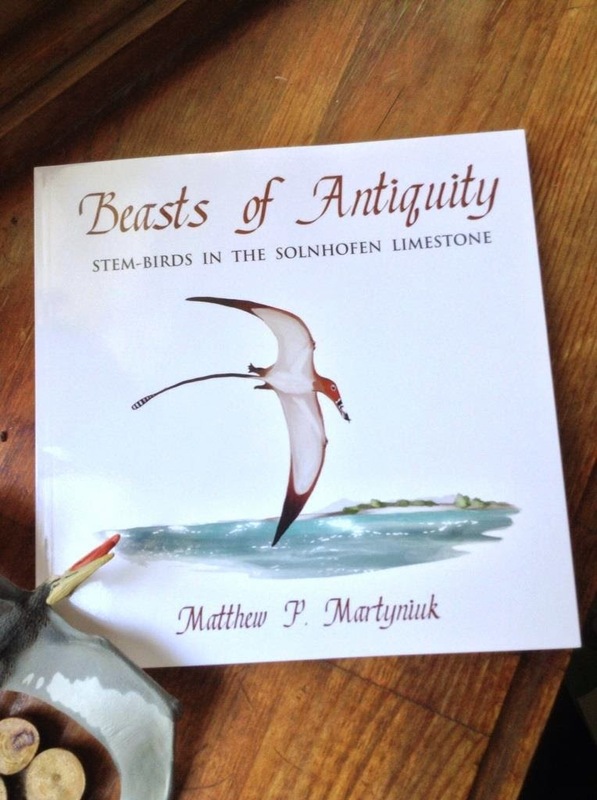 So, it looks like my new book, Beasts of Antiquity: Stem-Birds In the Solnhofen Limestone (Pan Aves 2014), is now available for preorder! Well, the ebook version anyway, but that's not a bad thing (see below). Beasts of Antiquity started life as "Age of Dragons", an idea to do a dinosaur book without really talking about "dinosaurs" (inspired partly by this post). The idea was to focus on all members of the avian stem group (and talking about the historical taxon name Dracones, hence the title), not just dinosaurs, each from a different continent or formation in different books in the series. The first was going to be focused on the stem-birds of North America and would feature many of the recent illustrations on my Web site, plus obviously a lot more. Suffice it to say this is a little ambitious for a summer project, so I decided to try releasing the whole thing piecemeal in short installments based on formation first. As I recently teased on social media, this particular concept would focus on several short, stand-alone ebooks that would later be combined with new material to form a single, print volume.